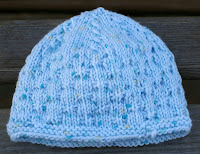 When I saw the "Tiny Bowknot" pattern in Barbara Walker's 2nd Treasury, I just knew I had to make a preemie hat out of it. It's just so cute and delicate, and perfect to spice up an otherwise typical stockinette hat. The stitch itself is easy to remember but uses the possibly novel "knit into the stitch below" (k1b) technique. Since you have half a prayer of keeping a hat on a baby's head, but very little of getting a tie on a squiggly babe, I chose to rename the pattern "baby bowties" - their heads can be fancy even if their necks aren't! Sk2p: Slip one stitch, knit two stitches together, pass slipped stitch over k2tog. Join for knitting in the round, being careful not to twist, and place marker. Rows 1, 2, 5, 6: Knit all stitches. Row 3: (P3, k3) 12 times. Row 4: (P1, k1b, p1, k3) 12 times. Row 7: (K3, p3) 12 times. Row 8: (K3,p1, k1b, p1) 12 times. Work pattern 3 times, then rows 1-4 once more. Round 1: (K9, sk2p) six times (60 stitches remain). Round 2 and all even rounds: Knit all stitches. Round 3: (K7, sk2p) six times (48 stitches remain). Round 5: (K5, sk2p) six times (36 stitches remain). Round 7: (K3, sk2p) six times (24 stitches remain). Round 9: (K1, sk2p) six times (12 stitches remain). Round 11: K2tog six times (6 stitches remain). Cut yarn and thread through remaining six stitches, slipping stitches off the needles. Pull tight to gather hole closed, and sew to inside of hat.